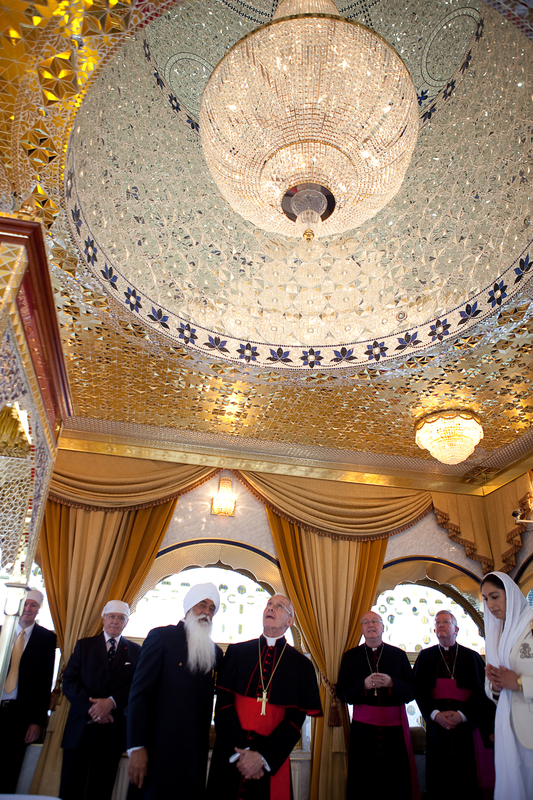 A red carpet was rolled out to welcome His Eminence, Cardinal Jean-Louis Tauran, President of the Pontifical Council for Interreligious Dialogue (PCID) and advisor to the Holy Pope when he visited Birmingham’s Guru Nanak Nishkam Sewak Jatha (GNNSJ), as part of his programme to help strengthen UK interfaith relations. Accompanying the Cardinal was Chair of Episcopal Office for Relations with Other Religions, Archbishop Kevin McDonald, the Archbishop of Birmingham Archdiocese, Archbishop Bernard Longley, Father Santiago Michael of the PCID and esteemed delegates representing the Vatican. The visit began with a humble presentation of bouquets by the guests to Guru Granth Sahib Ji, the eternal Guru of the Sikhs and receiving Guru Ji’s blessings. This was then followed by a visit to the roof-top Guru Darbar (prayer court) where kirtan (hymn) was being performed. The guests proceeded to visit the Nishkam Centre for refreshments. Interfaith dialogue on the theme ‘Catholics and Sikhs: Service to humanity as a contribution to peace’ followed thereafter in the Conference Hall. Bhai Sahib, an international promoter of faith and service, was created a Knight last year by the Holy Father Pope Benedict XVI in recognition of his dedicated commitment to working for peace among people of all faiths. At the event he affirmed GNNSJ’s modest endevours to help deliver the eight UN Millennium Development Goals (MDGs) adding three more issues that humanity needs to work on, which included, global extremism, global financial crisis and the global erosion of values. Bhai Sahib also stressed the need for a new consciousness, new ethos and mind-set coupled with empowering people with values to live in the new global village. 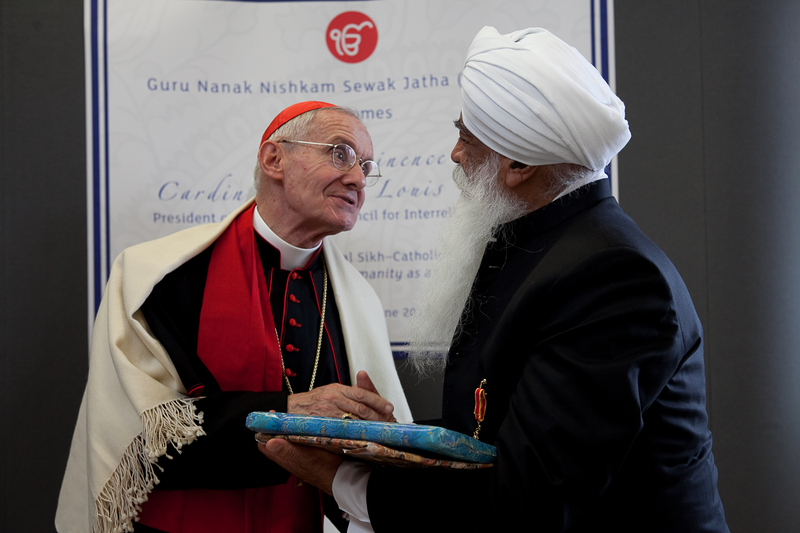 Cardinal Jean-Louis Tauran said: “I feel extremely happy to be here with you this day, in the course of my visit to the United Kingdom along with Father Santiago Michael of the PCID, aimed at promoting, through the local Church, “dialogue of friendship” between the Catholics and the Sikh Diaspora here. His Eminence went on to say, ”Today’s seminar on – Catholics and Sikhs: Service to humanity as a contribution to peace – incidentally is taking place in the premises of an organisation whose very name speaks for the importance of ‘service’ in Sikhi. Nishkam Sewa, as I am given to understand, means ‘selfless service’, selfless service for altruistic purposes, for the betterment of the society. three fundamental principles of Sikhism (Naam Japna, Kirat Karo and Vand Chakko). A concrete and a pre-eminent sign of this spirit of seva is seen in the langar, the free kitchen open to all in the Gurdwaras where every man or woman can find a free meal irrespective of what religion he or she follows, what social status he or she belongs to and wherever they come from”. Professor Gavin D’Costa shared personal reflections from his childhood. He went on to say, “There is a serious point embedded in these childhood memories. As the Guru Granth teaches, spiritual liberation is attained in the midst of laughing, playing, dressing up and eating. Traditional human activities of normal life are the pathway to God and through which God is seen. In Catholicism we too echo this remarkable insight: the everyday is the place of God’s grace. The history of Sikhism is replete with examples of service towards peace. Indeed, this particular Birmingham community has a distinguished history of peace making”. Dr Jagbir Jhutti-Johal articulated the importance of the Sikh ideology, of which Guru Granth Sahib is the embodiment and how Guru Ji encourages all good people of all beliefs to work together for a tolerant and just world order. The Sikh-Catholic dialogue reinforced the continuing warm and open relationship between the Sikhs in Birmingham and the Catholic Church and strengthened the infrastructure for engagement between Sikhs worldwide and the Holy See. Gifts were exchanged with the offering of ‘Robes of Honour’ and shawls to the visitors. The day ended with the sharing of Langar (blessed vegetarian food) from the Guru’s Kitchen, where over one million free vegetarian meals are prepared and served every year to visitors by volunteers. Read Bhai Sahib Dr Mohinder Singh’s full statement here. Read Cardinal Jean-Louis Tauran’s full statement here. Read Dr Jagbir Jhutti-Johal’s (University of Birmingham) full statement here. For his services to religious faith propagation, community service, education and research, Bhai Sahib has been awarded two Honorary Doctorates from Birmingham’s Universities. He is passionate about values-based education and is the Patron of the Nishkam Education Trust which has set-up Nishkam Nursery (2009), Nishkam Primary Free School (2011) and Nishkam Secondary School with 6th Form (2012). 2. The Millennium Development Goals (MDGs) are eight international development goals that were officially established following the Millennium Summit of the United Nations in 2000, following the adoption of the United Nations Millennium Declaration. All 193 United Nations member states and at least 23 international organizations have agreed to achieve these goals by the year 2015.